Bosch offers a full assortment of SDS-max hammer steel points and chisels. Bosch brings constant innovation to concrete and masonry drilling with increased effeciency and higher durability. All Bosch chisels are manufactured with a proprietary heat-treat process. The DEWALT MAXFIT Screwdriving Set features the 10X Magnetic Screw Lock System for fastener retention, minimized drops and reduced wobbling. MAXFIT bits are ideal for use in impact drivers and drill/drivers, and feature a precision-machined tip for an ideal fit in screwhead recesses for less stripped screws. They're made out of S2 modified steel for maximum durability. DEWALT 17-piece Metric Tap and Small Hexagon Die Set is a multi-purpose tap and die set. This set is ideal for repairing and creating a wide range of internal and external threads. Made from high carbon steel, the taps and dies are machined for precise threading and the black oxide drill bits are designed for long life. 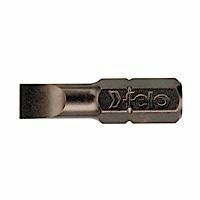 0.8 x 5 x 25mm Industrial Bit (10-Pack) The Felo industrial bits are precisely manufactured tools from special heavy- duty steel, superior hardness and torque which exceeds DIN and ISO requirements by up to 100%. The Industry Bits are designed for the highest requirements of industry and construction trades.